Jackson was taken by the Eagles in the first round of the 1988 NFL draft (13th overall). He was a two-time All-American in college despite playing in a ground-oriented wishbone offense, but while he caught only 62 career passes, he averaged 23.7 yards per catch and scored 14 touchdowns. With speed to match ideal size, Jackson immediately moved into the starting lineup for the Eagles. Eagles went 10-6 to finish first in the NFC East. Lost NFC Divisional playoff to Chicago Bears (20-12). 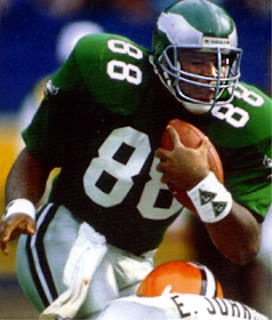 While injuries and holdouts marked his time in Philadelphia, Jackson caught 242 passes for 2756 yards and 20 TDs over the course of four seasons with the club. A fine downfield receiver from the tight end position, he was less accomplished as a blocker. Jackson was a consensus first-team All-Pro and was selected to the Pro Bowl following each of his first four years. Granted free agency in 1992, he signed with the Miami Dolphins and had a Pro Bowl season. Three years in Miami were followed by two in Green Bay where he was selected to the Pro Bowl for the fifth time in his last season which also resulted in a Super Bowl triumph. Overall for his career, Jackson had 441 catches for 5283 yards (12.0 avg.) and 49 TDs.